The deadline for submitting nominations for the Agribusiness Leader and NAMA Marketer of the Year awards is 5:00 p.m. today, January 15. The Agribusiness Leader of the Year award honors an outstanding leader in agribusiness, education, government service or other related areas. Solicited from senior level position holders in private, public or academic service, nominees should exemplify excellence in agribusiness by their significant contributions to the industry. Nominees do not need to be NAMA members. For more information on the Agribusiness Leader of the Year award visit, http://www.nama.org/awards/agribusinessleader.htm. The NAMA Marketer of the Year award is the most prestigious honor awarded to an active member of the association and honors outstanding accomplishments in the field of agri-marketing. Nominees are solicited from agribusiness and related companies with overall marketing and/or sales responsibilities. Nominees must be NAMA members. If you are interested in nominating someone for the NAMA Marketer of the Year award, please fill out the nomination form on-line now at http://www.nama.org/awards/namamarketerform.htm or download the NAMA Marketer of the Year nomination form in an Adobe .PDF format by visiting, http://www.nama.org/awards/mktrapplication.pdf. For more information on the NAMA Marketer of the Year Award, visit, http://www.nama.org/awards/namamarketer.htm. The Region IV Best of NAMA Ceremony will take place this Thursday, January 17 at The Abbey Resort, 269 Fontana Blvd., Fontana, WI 53125 (on the western shore of Lake Geneva). The Region IV Ceremony will begin at 5:30 p.m. with a reception, followed by dinner at 6:30 p.m. and the awards presentation at 7:30 p.m.
To book a room at the Abbey Resort call 1-800-709-1323. Make sure you mention NAMA to receive the $109 discount rate. Cost for the ceremony is $65.00 per person. Register on-line at http://www.nama.org/amc/bon/register.htm or by calling 913-491-6500. The Region II Best of NAMA Awards will take place, Tuesday, January 22, 2008, at the VooDoo Lounge at Harrah’s Casino, One Riverboat Drive, North Kansas City, MO 64116. Cost for the Awards Ceremony is $65/person. A block of rooms is available at Harrah’s for $99 for out-of-towners. For reservations call: 1-800-HARRAHS (800-427-7247) and make sure you mention NAMA to receive the special rate. The Banquet will begin at 6:00 p.m. with cocktails followed by dinner at 6:30 p.m. and the awards presentation at 7:00 p.m. 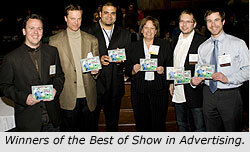 The Midsouth Best of NAMA Ceremony will take place January 17, 2008. The evening will kick-off with cocktails at 6:00 p.m. with a dinner and awards presentation following. Please join Midsouth NAMA at the Equestria Restaurant, 3165 Forest Hill Irene Road, Germantown, TN, ph. 901-869-2663. Please RSVP for the Midsouth Best of NAMA Ceremony today at http://survey.archermalmo.com/TakeSurvey.aspx?PageNumber=1&SurveyID=96KMm88. Microbial Sciences Building, Room 1520. Badger NAMA is co-sponsoring the event along with the Wisconsin Farm Bureau, UW-Madison College of Ag & Life Sciences, UW-Extension and the Wisconsin Federation of Cooperatives. The Ag Outlook Forum is open to all, so feel free to invite co-workers and friends. Please join Midlands NAMA for a panel discussion with Lindsay Corporation’s vice president of marketing, Dirk Lenie and Jim Farrell, president and chief executive officer of Farmers National. They will address where the agriculture industry is headed, what technologies will lead the charge and how their companies are adapting to lead the marketplace. When: Tuesday, Jan. 22 – 3:30 to 5:00 p.m.
We look forward to seeing you there for the discussion. Please feel free to forward this invitation to anyone else in the ag industry who you think should attend. Meetings are $15 for chapter members and $20 for non-members. Please RSVP to Vernon Benes at vbenes@beckag.com or call 402-991-6338. For more information, visit www.midlandsnama.com. Make plans now to attend the 2008 Carolinas/Virginia Chapter Best of NAMA Awards Banquet on Thursday evening, January 31, 2008. Expand your plans to include the Southern Farm Show on Thursday afternoon or Friday morning. Time: 4:30 p.m. – Registration & Networking; 5:30 p.m. – Awards Program; 7:00 p.m. – Dinner; 7:45 p.m. – Best of Show Awards; 8:00 p.m. – Adjourn. Mark your calendars and share this date with your colleagues as we will assemble at the NC State University Club (map), 4200 Hillsborough Street, Raleigh, NC, to view some of your best work of the past season. Option: Southern Farm Show – in the afternoon before the NAMA Awards Banquet or the following morning. Registration: To register for the Carolinas/Virginia Best of NAMA Banquet visit, http://payment.nama.org/chapter.htm. Make plans to attend the NAMA Mixer at World Ag Expo, Tuesday, February 12, 3:30 – 5:00 p.m. in the Alta California Booth #DSI48. Take the opportunity to network with colleagues, marketing professionals, and make new friends. There is no better way to kick-off your week in Tulare, CA! RSVP by calling Dee Monsen at 916-928-1625 ext. 203 or e-mail dee@capca.com. It’s a brand new year, and NAMA has some powerful new ideas in store for you at the 2008 Agri-Marketing Conference. Learn about the innovations and changes in the industry that will shape the way you do business in the year ahead. New business models. Changing economies. Changing consumers. And speaking of change, the opening morning of the 2008 program will feature not one, but two, best-selling authors who will share strategies from their latest books. Learn to create – and deliver – messages that stick from Dan Heath. Plus you’ll discover how to successfully draw upon the power of community and collaboration to reap winning results in your business from Barry Libert. You should be receiving your conference brochure in the mail this week, however, you can get an early jump and check out all the sessions and events on-line at www.nama.org/amc. To register for the Agri-Marketing Conference visit, http://nama.org/amc/register.html. 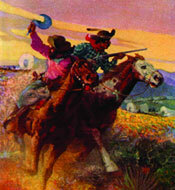 We look forward to Leading the Charge with you in Kansas City! The National NAMA office is seeking a qualified candidate for the position of manager, chapter services/membership. This position manages the relationship of NAMA headquarters with 24 professional and 35 student chapters. The qualified individual is responsible for assessing chapter needs, monitoring chapter activity, communicating products and services and providing guidance as needed. They will also be responsible for managing membership recruitment and assisting chapters with their recruitment efforts and will work directly with Chapter Services, Membership and Careers committees. Heavy travel is required. This position requires a bachelor’s degree and 1-3 years related experience in member/chapter relations, marketing, client services or event planning. Association experience is a plus but not a requirement. The individual must be able to meet deadlines and manage details of multiple projects simultaneously. Should have strong verbal and written communications skills. Interested candidates should send resumes along with a cover letter to: NAMA, 11020 King Street, Suite 205, Overland Park, KS 66210 or via e-mail to info@nama.org. Nearly 150 attendees celebrated agriculture’s most notable advertising and public relations triumphs of last year at the Region III Best of NAMA Ceremony on January 10. The event was held at The Metropolitan Ballroom and Clubroom, in Golden Valley, MN. A list of all Regional winners will be listed on the NAMA web site after February 1. Missouri Governor Matt Blunt addressed a big crowd in St. Louis at his annual ag conference. 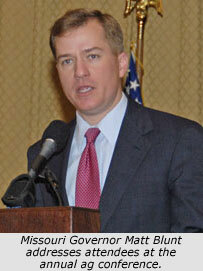 It was also the Gateway NAMA meeting in conjunction with the St. Louis Ag Club on January 7. Gov. Blunt announced his plan to establish Dairy Parlor Renovation Grants to help expand Missouri dairy farms. The grants will help producers at older dairies with the costs of parlor renovations for more efficient milking, allowing them to grow their herds. New technology and a “parabone” design allow producers to cut their milking time in half. The governor is calling for $200,000 to help producers make needed renovations in the first year. The grant will require producers to share 50 percent of costs and will be awarded up to $10,000 per grant. The governor will also recommend $4 million in new funding for Port Authority capital improvement projects. The projects support infrastructure critical to growing Missouri agriculture needs. Gov. Blunt announced his plan to establish the Farm Legacy Exchange Program, which will help keep Missouri’s farming industry strong for future generations by facilitating succession planning. The Farm Legacy Exchange Program will match beginning farmers with farmers nearing retirement to help form a working relationship and strategy to transition farming responsibilities and designated assets from existing farmers to beginning farmers. The Farm Legacy Exchange Program addresses a growing need as the average age of working farmers has risen to 60. In addition, the program will help young farmers address the rising cost of production land through collaboration with experienced farmers considering phasing out their operations. The governor’s new program will match veteran producers ready to retire with younger producers based on a survey of each farmer. The program will provide estate planning, legal contacts and access to all the financial incentive programs administered through the Missouri Agricultural and Small Business Development Authority. The Farm Legacy Exchange Program is a collaborative effort among the Missouri Department of Agriculture, the Missouri Farm Bureau, University of Missouri-Extension, Farm Credit Services, the Department of Elementary and Secondary Education and the International Farm Transition Network. Governor Blunt’s speech at the luncheon was recorded. To hear the speech visit the Gateway NAMA web site at www.gatewaynama.com. Nearly 30 Badger NAMA members traveled to Johnson Creek to learn how they could harness the latest innovations in communication technology to effectively attract their target audience in the “Trends in Communication Technology” Seminar on Wednesday, December 12th. The seminar kicked-off with a presentation by Michelle Branzolewski of K-Kom Marketing Communication, which highlighted the fundamentals of successful website development and marketing, in order to convert website visitors into customers. 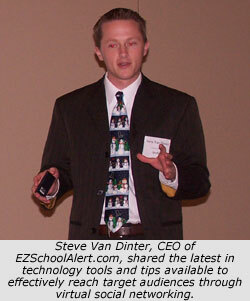 Steve Van Dinter, CEO of EZSchoolAlert.com, followed by walking members through the evolution of technology and outlining how tools such as e-mail, text messaging, blogs and message boards are being used to reach distinctive audiences. Social networking and virtual mediums, such as Facebook and Second Life, are up and coming mediums attracting today’s youth and will be essential for reaching them as consumers in the future. The final presentation, by John Gilbert, Vice President and Director of Digital Solutions Group with Bader-Rutter & Associates, focused on building brands through digital solutions. Digital technology offers a unique opportunity to encompass personalization, customize content delivery and allows cross-media delivery, which in return, increases response rates and increases customer purchases and retention. A panel discussion and audience question and answer session rounded out the morning’s presentations.